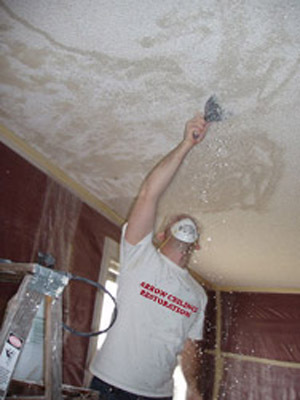 Arrow Ceiling Restoration has been specializing in popcorn ceiling removal and repair and ceiling texturing since 1987. Kris Gearty is not just owner operated, but personally oversees every aspect of the work and in most cases does the work himself. That means the work will be done by the person with whom you consult with, someone with over twenty-four years of popcorn ceiling removal and repair and ceiling texturing experience. Arrow Ceiling does more than just offer competitive prices on ceiling work and painting services, we go the extra mile to be clean and dust-free. More than just a ceiling company, we take pride in being a ‘customer service company’; your complete satisfaction is our goal. Our hope is that you will gladly and enthusiastically refer us to your friends and colleagues. Our team of ceiling professionals will remove your acoustic popcorn ceiling and help turn your house into a home. We work with accuracy and precision to ensure quality service. Our proven methods cut down on the mess during removal. As you probably are aware, acoustic popcorn was a shortcut used by contractors to cut down on the cost of finishing ceilings (the most labor intensive area of the home). Just removing the old outdated finish will not leave your ceiling ready for any other texture other than acoustic! Our process of refinishing your ceilings not only provides the additional finishing necessary for your chosen new texture, it also repairs any damage that may have occurred during removal. You choose if we continue past the process of texturing and provide priming and painting services. Should you decide to do so yourself we will gladly assist you in choosing the right products and applications. Are you looking to match a texture? Arrow Ceiling Restoration provides top notch wall and ceiling texturing for your home. From just an accent wall to whole house re-texture, from heavy texture to level five smooth wall, from ‘old school plaster finishes to hand texturing, we do it all! If you're looking for a Valrico Ceiling Contractor Specializing in Popcorn Ceiling Removal, Popcorn Ceiling Repair, Drywall Repair, and Texture Ceilings and Walls, contact Arrow Ceiling Restoration today at (813) 840-3717, or complete our estimate request form.